Dave Price is the weather anchor for the CBS' "The Early Show" and covers major weather events for the "CBS Evening News." He joined CBS News in July, 2003. Each weekday morning, Dave provides viewers across the country with a look at the forecast and more. In addition to talking meteorology and reporting on-site from hurricanes, tornadoes, flooding, blizzards and wildfires, Dave travels throughout the country and around the globe bringing amazing stories to millions of viewers. Dave has had a first-person view of some of the most momentous events of our time and has shared those remarkable experiences with his audience. He was in New York City, live on-air, as the first tragic moments of Sept. 11 unfolded; he was one of the first reporters on the scene when American Airlines Flight #987 went down shortly after take-off and he was one of the few reporters who spent the night enduring Hurricane Katrina inside the Superdome in New Orleans with the people he was covering. He also covered the earthquake in Haiti in 2010 and the oil spill in the Gulf of Mexico for the Network. He's been on the frontlines of the war on terror in the mountains of Afghanistan and has been through Iraq five times (including the night Saddam Hussein was executed). On more pleasant occasions, Dave has been at the center of the action for Super Bowls, NBA Championships, Final Fours, US Opens and the Olympics. Dave's at his best though when he's doing something and he brings his TV family along. He's flown with the Blue Angles over the Florida coastline, canoed down the Amazon in Ecuador, and rode Harley Davidson's in the Australian Outback. His stops have taken him to every state in the nation and to over 80 countries around the globe - not a bad way to earn a living. Dave has covered an incredible array of stories for someone whose primary assignment is weather - even more remarkable when you consider that he didn't even enter the broadcasting industry until he was almost 30 years old. Armed with a Bachelors Degree in Industrial and Labor Relations (1987) from Cornell University and a Masters Degree in Organizational Psychology from Columbia University (1993), Dave spent almost a decade as a human resources executive with Pepsi-Cola, Texaco, and Taco Bell. His job was to advise those companies on how to "run better." That was until the fall of 1995 when he finally started listening to his own advice. He aggressively shed 80 pounds and boldly made the most of meeting a small-town TV anchorman. Dave quit his job and pursued his passion. His transition took him from 242 pounds to 163, from Newport Beach, Calif., to Erie, Pa., and from the office chair to the anchor chair. 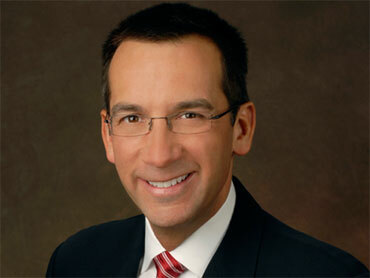 After a year at WSEE-TV in Erie, Dave joined WBBM-TV Chicago as its morning weather anchor. In Sept. 1998, he joined FOX Television's "Good Day Philadelphia" and anchored there before moving to New York and Fox's Flagship station to do weather and co-host WNYW-TV's "Good Day New York." He later joined WCBS-TV and then CBS News. He's won five Emmy awards and a Gracie award for his work. When Dave is not reporting for "The Early Show," he is involved in numerous local and national charity organizations, including Stars for Stripes, the Near and Far Foundation and the ASPCA. Dave is a certified scuba diver, a licensed pilot and an avid photographer. He's one of four brothers whose parents have been married 52 years. He is married to Jacqueline and they have a dog Walley. They split their time between New York City and Connecticut.